Note: Comments on this site will be deleted if it’s obvious the writer is only trying to attack. It’s my site – my rules. Either come here to have discussion or start your own site. Note to the idiot commenting about BEC. The election results are not posted where they should be – under ELECTION RESULTS. Using the Search box did not locate them either. Since BEC posted them in a place nobody would ever look for them, the story stands as written. Comment again and you will be deleted AGAIN. I might have responded to your first comment if I hadn’t been out of town. Since you left 3 or 4 more comments showing you are unhinged, you don’t deserve a response. Yesterday the paper reported on the latest loss for Grossinger Motors Arena. Funny, the story doesn’t say if the loss is audited or what VenuWorks reported. At this point it should be audited. Monday Venuworks staff is presenting the results to the Council. If that presentation was audited, it should be the auditor reporting. We know reports generated by the previous management weren’t close to audited results. Audited losses were always much higher because CIAM was good at not including current liabilities, like payroll. Monday night’s report may be nothing but deflecting audited numbers. We won’t know until those are released. Last year the City held those for months. The Coliseum audits weren’t intended to find fraud, so auditors were never engaged to audit concessions. John Butler would not have allowed an audit because he claimed that division was a private company. Hence the 111 felony charges while David Hales, the finance department, Tari Renner, and the City Council sit open-mouthed claiming they had no idea! Of course, that’s a joke. That loss includes depreciation (meaning writing off the cost of the building as an expense), if that expense is taken out, CIAM still lost $22,943. Where did the Pantagraph get their number? Why did they go all the way back to 2013? To deflect that NO financial information is available for 2016? The reason nothing is available for 2016 is because the City didn’t even try to protect information at the Coliseum when John Butler announced he wasn’t renewing the contract. Nobody cared when a shredder truck pulled up outside the Coliseum and was fed documents. Nobody cared that the arena and the documents belonged to the taxpayers. It’s more than obvious nobody at any level cared. When VenuWorks took over, they loaned money to the City who then loaned it back to them for remodeling. I bet this $375,000 wasn’t applied to what the City owes VenuWorks. I bet this money is GONE! Ask people running for the Council if they will vote to end the fleecing of Bloomington taxpayers. Economic impact numbers are made up. Anything government steals from you to fund their folly has a negative impact you. The increased sales tax will cover the bond payments. A few community events can be held there, the Ice Center (with no real name) can use the ice for free instead of paying VenuWorks to use it. Why does Mike Matejka have any credibility? 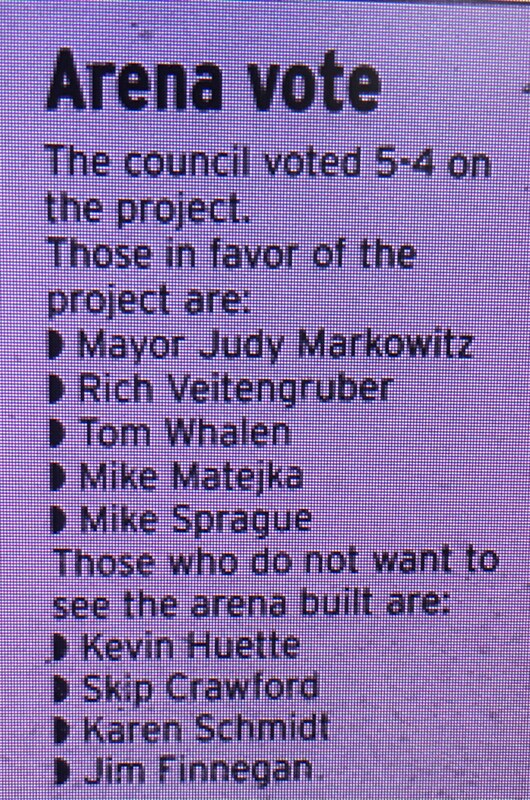 Citizens said Not In Our Town to building the arena. I wonder if Matejka’s Not In Our Town is his way of slapping back at those who voted against it in the referendum? Too bad you are paying for an elevator now. Blame Matejka for that expense too. The plan and builder were picked so local labor could build it, being ADA compliant didn’t matter. Posted in BloNo, Bloomington, BLOOMINGTON CITY COUNCIL, budgets, elections, Liberal Media, Local, Pantagraph, Progressives, Renner, Taxes.Tagged audited financial statements, CIAM, Coliseum, Grossinger Motors Arena, John Butler, Mike Matejka, VenuWorks. How many of the candidates who are currently running for Council are even aware of the massive financial drain the Arena has been during the past 10 years? They all seem to be focusing on the redevelopment of downtown, something that has been attempted for at least one-quarter of a century, including the building of the Arena. Now the discussion is turning to a sports complex, perhaps to deflect from the failure of the Arena. I’m thinking only one. The rest believe whatever they are told to believe. The Coliseum is never going to be successful. It is a dumpster fire that burns 100 dollar bills every month it stays in operation. Someone in government needs to be an adult and admit the reality of the coliseum. It needs to be closed and put up for sale. Enough of this silliness…. Maybe the same people who are going to buy the State Farm building. Well we can pretend that someone would want it… ? Maybe convert it into a library “community center”? How about a bus size hole in it to make it into the Transit Disconnect downtown hub? Buses drive in one end… pick up their 3 passengers and drive out the other end onto the street. Perhaps a homeless day spa (with deep massage benches) to provide a nice place for the homeless population to spend time in during the daytime hours? I have another idea for the coliseum but it involves a wrecking ball and a Cat D-9 bulldozer…. I agree with closing it since it is dark most of the time anyway. Losing money on shows is foolish. Using it only for City functions like the winter farmers market and for parks & rec would make more sense. No need to hire a management company. Limited utility usage. Limited custodial and security personnel. Pay off the bond, tear down the building and sell the property for “shovel ready” private development. There you go.. talking like a sensible human being who wants to deal with reality…. and stop the hemorrhaging of taxpayer money… You will never be on Tari’s “good old boy list” with that sort of talk! People, the Ice Center actually has people using it! No easy answer. The numbers need to be closely examined. The ice center breaks even with operations but still owes on the debt. So, when this “Markorena” does START to make money , in say 2525, do we get rebates on our investment? Or would a well placed charge of high explosives be a more suitable economic solution? As far as I see it, a dumpster fire would draw more of a crowd! I find it to be very simple regarding the Arena/Coliseum fraud and bleeding (approximately $700,000/year – Not including the Bond payment). Put a “Closed” sign in the window and padlock the doors. Then we would ONLY be making the Bond payment! Sounds unanimous. Shut it down to save money. Bob you have a good idea there. Just keep the ice rink open and shuttered the rest.